After meeting with some lovely ladies today, I wanted to do a short posting about St. Padre Pio. 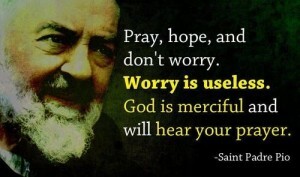 It seems that this wonderful saint has touched the heart and lives of many people around me. 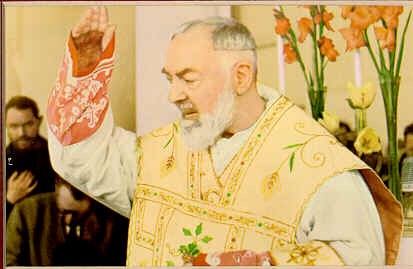 An interesting point that was brought up was that they felt that St. Padre Pio found you. To say that when you needed him to intercede for you his words, holy cards or stories of him would continue to come into your life via one way or another. People whom have a devotion to him feel a special connection and have prayer requests that have been answered. Inspired by this I thought it would be nice to share some of his inspiring words. Just before I do that I want to share the most powerful story I ever heard about this saint, from a friend. One that taught me a lot about how we are called to love, pray and hope – and let our heavenly Father be the judge of all through his mercy and love. For only God knows what truly lies within our hearts! The was a women whom was in a church one day, she was bend over kneeling and crying her eyes out, you see her beloved husband had taken his own life. Her loss and his tragic death were just too much for her poor heart to bear. Father Pio was at the time saying confession, but suddenly she felt a presence beside her and then she heard the words, fear not there was time between the bridge and the water. Your husband is with God. When she looked up she saw Fr. Pio and was filled with great peace. Prayer is the best weapon we possess. It is the key that opens the heart of God. Jesus will assist you and give you the grace to live a heavenly life and nothing whatever will be able to separate you from His love. In all the events of life, you must recognize the Di vine will. 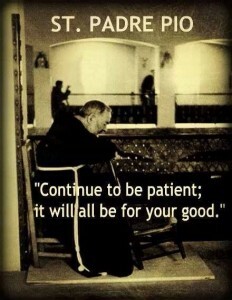 Adore and bless it, especially in the things which are the hardest for you. Humility and purity are the wings which carry us to God and make us almost divine. In my greatest sufferings, it seems to me that I no longer have a mother on this earth, but a very compassionate one in Heaven. Our Lord sends the crosses; we do not have to invent them. Love Jesus, love Him very much, but to do this, be ready to love sacrifice more. Charity is the measure by which Our Lord judges all things. You must always humble yourself lovingly before God and before men, because God speaks only to those who are truly humble and He enriches them with His gifts. Don’t allow any sadness to dwell in your soul, for sadness prevents the Holy Spirit from acting freely. Thank you for this. This is beautiful and enlightening.